If you have changed your scale's location or dropped it, your small scale will need to be calibrated. Small scales are sensitive to movement and must be calibrated frequently to accurately measure weight. When you calibrate a scale, you need a fixed amount of weight. A quarter weighs 5.67 grams, according to Cornell University. Scale calibrations also need to be calibrated to their approximate maximum weights to ensure accuracy of the measurements. Locate the calibration tool on the scale. For digital scales, the calibration switch is located on the back of the scale or by pressing a sequence of numbers on the control panel. Check the manufacturer’s user manual for specific calibration switch location or settings. Adjust the settings for fixed weight. Enter “5.67 grams" for the fixed weight. Place the scale on a level surface. Place a new quarter on the scale. Used coins contain oil, dirt and debris that alter the true weight of the coin. Check the weight on the scale’s display. If the scale does not read 5.67 grams, adjust the calibration up or down. Enter the difference between the actual weight of the quarter and the reading that shows up on the scale. Calculate the maximum weight for the scale. Divide it by 5.67 grams. 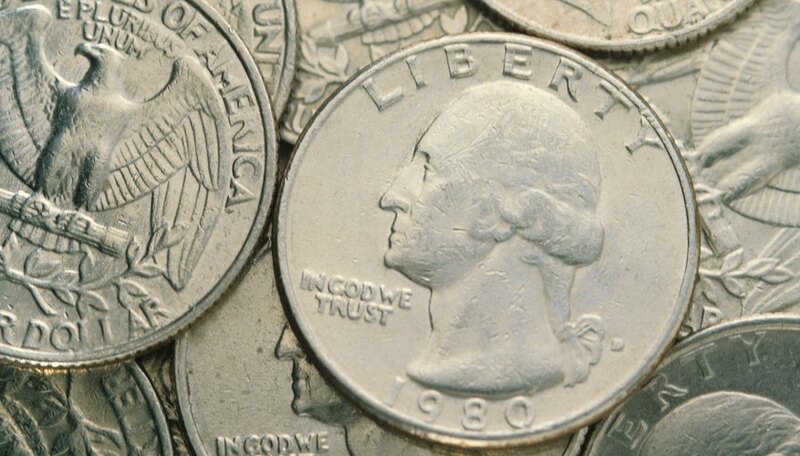 The quotient is the approximate number of quarters to place on the scale. For example, the maximum weight of the scale is 100 grams. Divide 100 by 5.67. The quotient is 17.63. Place the number of quarters closest to the quotient you calculated on the scale. In the example, you would put 17 quarters on the scale. Multiply the number of quarters by 5.67. In the example, the product is 96.39. If the scale does not accurately read the weight of the coins, adjust the calibration up or down. Enter the difference between the actual weight of the quarters and the reading that shows up on the scale. The calibration methods and switches on scales differ by manufacturer and model. Check the scale’s instruction manual to get the exact settings and instructions. What is a Double-Pan Balance Scale? Kim, Clayton. "How to Calibrate a Small Scale With Quarters." Sciencing, https://sciencing.com/calibrate-small-scale-quarters-12097140.html. 24 April 2017.